So little is really understood about the progression of myopia (near-sightedness). Many of my patient's parents are quick to blame computer games and the large amounts of homework required by schools as to why their children's vision is getting worse from year to year, but these culprits are too simplistic. Genetics, environmental influence--it seems to all be connected. But new research points to a surprising new potential culprit -- light. 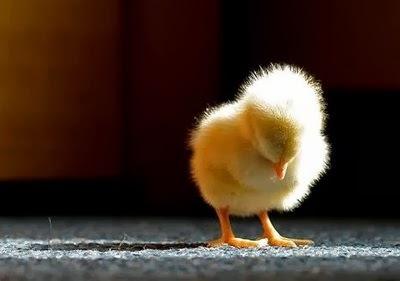 Around 2011 several reports came out linking myopia to reduced sunlight exposure in studies performed with baby chicks. Sunlight, it appears, increases the rate of release of retinal dopamine, which inhibits growth rate of the eye. Myopia is a result of light falling in front of the retinal photoreceptors, most often due to a longer than normal eyeball. The more the eye grows, the more near sighted a person will be. Researchers suggest 10-14 hours per week of outdoor light exposure may help slow myopia progression, but more studies need to be performed for this effect to be truly demonstrated. A new study published in December takes our understanding of light's effects on myopia to a new level. In their experiment, Foulds et al separated baby chicks into red light and blue light exposure groups with a 12 hour on/off cycle for a period of 2-6 weeks. The results were amazing -- the red light group showed marked progressive myopia and the blue light group showed progressive hyperopia (far sightedness). And then they did something even more impressive -- by putting the red-light raised chicks with now high-induced levels of myopia in blue light for 3 weeks, they reversed the myopia. The same held true for reversing the hyperopia. So what does this mean for us? We are a long way from putting your child under blue light for 12 hours a day, but we are beginning to understand what is happening on the neurologic level of the eye when refractive error is created. So many of our methods of reducing myopia have shown limited response, but maybe the future looks brighter. If you are worried about your child developing high levels of near sightedness, my best recommendation to you is get them involved in outdoor sports. Wear proper sun protection of course, but the more time spent outdoors with ambient light levels, the better your child's chances look for a lower prescription! very interesting! I wonder how spectral maps of our lights in schools, offices, and home lamps could tie in with this. Most computer/electronic device light skews towards the blue wavelength, so could computer use be protective against kids being more near sighted? It would be a complete reversal of the average population's beliefs on video games being so bad for their kid's eyes. Blue light isn't without its own side effects though--it can disrupt normal sleep cycles and increase risks for diseases like macular degeneration. So at this point, it is safer to recommend outdoor light rather than blue light specifically for near-sightedness control.